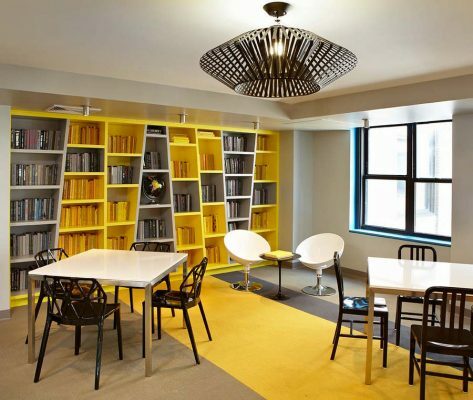 The New Yorker Hotel Student Commons occupies half of a 20,000-square-foot, full-floor renovation of the sixth floor of the New Yorker Hotel in midtown Manhattan. Educational Housing Services (EHS), which runs four other facilities in the city, leases the building, turning the first five floors into student housing that is in turn leased out to several local colleges. This project is part of EHS’s move to replace small and isolated satellite cooking facilities and lounges embedded among dorm floors with large, vibrant, multi-faceted spaces complete with cooking, dining, library, recreation, film screening areas, and more. 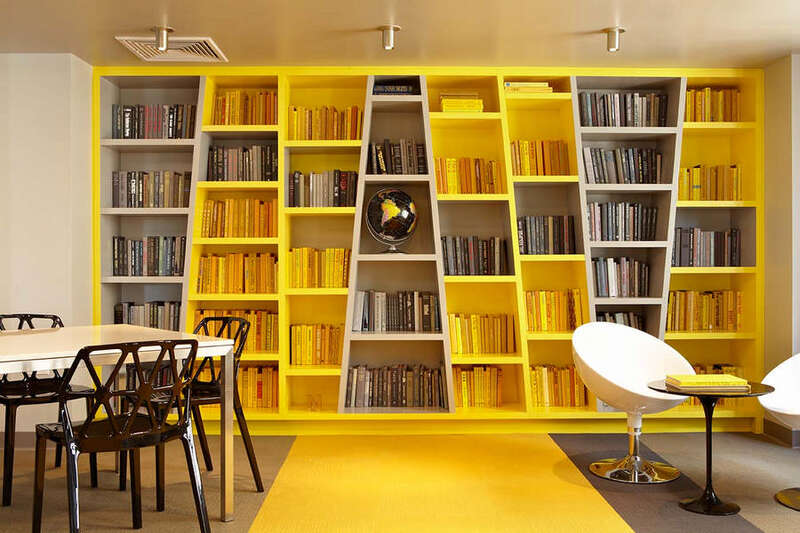 The firm’s design for the project is casual, with a multitude of places to “hang out.” The cooking facilities and lounges vibrate with a lively palette of paint, tiles, and Trespa paneled cabinets. 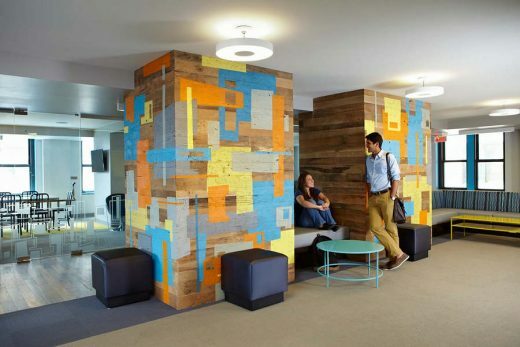 • The firm collaborated with artist (and professor at Pratt Institute) Chris Wynter to create a fun motif on lounge columns clad with reclaimed wood. The firm has worked with Chris before, on the designs for Pranna and Mint. 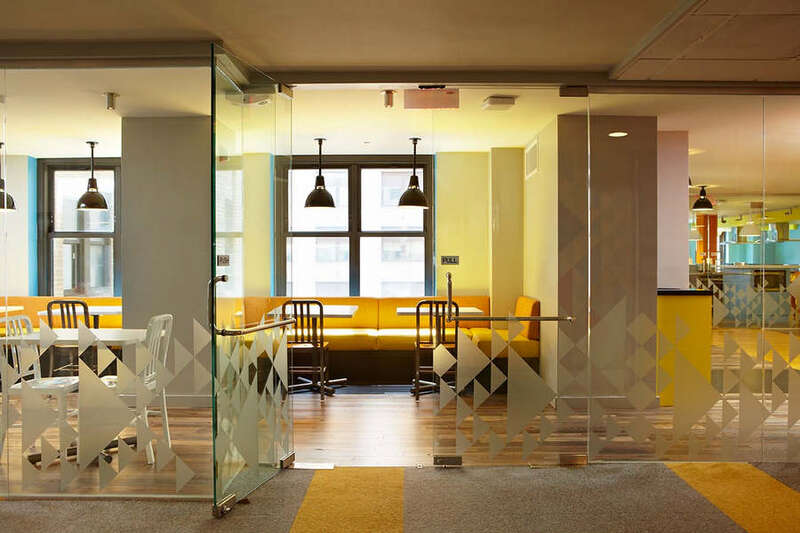 • Custom geometric wall graphics designed by the firm wrap the public corridors, printed on an eco-friendly wall covering backing, Terralon. • Custom-frosted glass decals by the firm mimic both the wall covering and the artist’s wood painting motifs. • The library lounges have angled, colored MDF shelving that will be filled with matching color books. In 2010, Wid Chapman Architects executed a 9,000-square-foot renovation at EHS’s St. George Hotel facility in Brooklyn Heights. This endeavor created nothing short of a social transformation for its young inhabitants. EHS expects similarly transformative results with the New Yorker project.